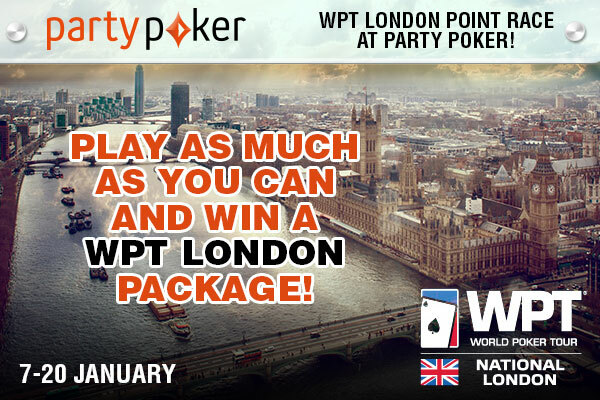 The winner of our exclusive PartyPoker point race (which runs between January 7 - 20) will receive a $800 package to a WPT London side event! Be the most active player and gather points every day! PartyPoker and Rakerace.com are organizing a point race promotion between January 7 - 20, the winner will receive a package to a WPT London side event, which contains a buy-in for the $320 NLHE side event and $480 spending money. The race is exclusive to players registered to PartyPoker through Rakerace.com. The final result will be determined by the total number of daily points gathered, so if you want to win, you have to be consistent, it's not enough to grind a couple of days at higher stakes. In case of a tie, the winner will be decided based on their daily finishes. For example if two players finish with the exact same amount of points, but one of them got more daily first finishes, he will be the winner. If this number is the same, then the most second places will be taken into account, and so on. The special point race is great motivation to start off 2015 strong, battling the other players every day, and the winner can prove themselves in a live arena in one of the WPT tournaments. The speciality in the point race promotion is that we reward daily performance. The winner of every day will receive 100 points regardless of how much rake he/she generated, and several other spots also receive points. The final result will be determined by the total amount of daily points received.